2/6/2014Share this story on Facebook! As I walked onto the World News with Diane Sawyer set, I immediately felt the power of my surroundings. The large bright lights and slick monitors surrounding the stage were overwhelming, intimidating, and exciting all at the same time. It’s not every day that a group of college juniors and seniors get to tour the ABC News studios and meet with top executives in New York City. This trip was made possible by a mini-course offered through the Roy H. Park School of Communications. “The objective of this mini-course is to generate awareness for job opportunities and industries that were previously not on a student's radar…the purpose of this course is to create a ‘disruption’ in students' career perceptions and broaden their options,” said Scott Hamula, chair of the Department of Strategic Communications. Each year, 15 students participate in this unique learning experience to meet working professionals and Ithaca College alumni over Winter Break. This year, the site visits included McCann-Erickson Worldwide, a global advertising agency; Civic Entertainment Group, a strategic marketing agency co-owned by Ryan Seacrest; Sony Pictures Television, one of America’s largest television and film production companies; as well as ABC News. Students were also invited to attend Network Nights, a gathering of current students and more than 200 alumni for a networking reception in New York City. Sharon Otterman, ’81, chief marketing officer of NBC News, was the keynote speaker at this event. The most exciting part of Network Nights was talking to alumni in all different fields and learning about different industries. I even got to speak to several alumni who work in human resources who gave me tips about applying to entry-level positions at their companies. Following the Network Nights reception, my peers and I spent the next two days learning directly from professionals about their industry, careers in the field, and tips on how to obtain jobs or internships. When we reached McCann-Erickson, we stepped off the elevator where we were supposed to be meeting our host, Matt Rakow ’10. Immediately, hugs and smiles were exchanged as another employee, Rachel Heiss ’13, happened to be walking by the elevator when we got off. IC alumni really are everywhere in the advertising and marketing world. Following McCann, we headed over to Civic Entertainment Group where Jimmy Knowles ’12, assistant to the CEO, spoke to us about what he does in his current position. Aside from getting to travel to different events, Knowles is working on a project for several clients where he will go to an Oscars after party and attend the South by Southwest (SXSW) Film Festival. We also heard from other executives at his company who work on large projects with clients such as Martha Stewart and the Education Nation summit. I left the agency visits feeling inspired about the marketing world and appreciative of the alumni who were generous enough to host us for the day. We kicked off the next day learning about Sony Entertainment’s newest Playstation4 and how the digital team utilizes all of its features. Many of us had never really considered a career in digital advertising, yet these visits made us realize the options that are available to us as communications majors who would soon be entering the workforce. After three information-filled site visits, we finally made it to Columbus Circle for our last visit of the trip. 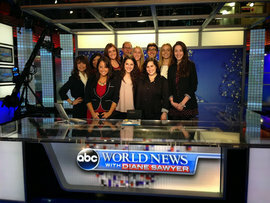 As we walked on the set of ABC News, we were greeted by alumnus and Emmy-award-winning journalist, David Muir ’95. He had just finished the Friday taping for 20/20 and was thrilled to have students from his alma mater visiting. Muir brought together IC alumni from all over the studio who spoke about their experiences. They even took us to a variety of studios within the building where we watched what had just been shot get edited to air that night. Getting to see the latest episode of ABC’s 20/20 before America did was definitely one of the coolest feelings. As we were leaving ABC Studios after our thrilling day, I could tell from the excited looks on my classmates’ faces that everyone learned something valuable from this experience.